SEA LIFE Birmingham is suitable for all ages.  Your ticket includes our fun, educational talks from our resident experts, our interactive Rockpool experience where children and adults alike can touch a Starfish or crab, a soft play area*, our amazing 4D cinema experience and all of our fantastic displays. *Please note: We recommend our Soft Play area as being suitable for children aged 3-5 years. Parents/Guardians must stay outside the soft play area to supervise their children.